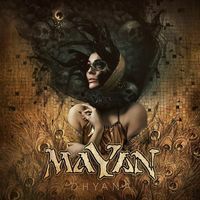 MAYAN is a Dutch Symphonic Death Metal collective, featuring numerous musicians throughout its somewhat short history; it is a side project from the guitarist from EPICA, Mark Jansen. EPICA is a personal favorite of mine, so I was anxious to see what else MARK could come with us, considering with his other band alone he has had three releases since 2016. “Dhyana,” is proof that his creative well is nowhere near reading to run dry, in fact he might have too much to write about at times.There are a lot of different things going on within the 65 minutes that encompasses the album and sometimes things can get a bit muddy and it becomes hard to keep track of everything. The production, while good, does tend to bury things in the mix, especially the vocals. Production/mixing quibbles besides, this is a meaty album with plenty of bells and whistles for fans to pick out and something for everyone. MAYAN is more often than not much more intense than EPICA although not quite as bombastic. Here, the symphony aspects are powerful but the metal aspect is definitely the focus of the music. Heavy crunch, fast guitars, and overall brutal wall of sound combined with several different types of Death growls give the song a near constant Death Metal sound, albeit more symphonic and operatic—think a less dark version of SEPTICFLESH. The album opens with symphonic textures from City Of Prague Philharmonic Orchestra, evoking a theatrical atmosphere, something that you might hear in the opening credits/scenes of a high budget movie. Things are quickly bound in molten steel of Metal, with operatic male cleans, eviscerating Death grunts and growls, and the galloping of guitars ripping through the epic atmosphere. The clean keys form gentle textures while the sweeping orchestration and operatic female vocals heighten the imagery from the third track, “Saints Don’t Die.” I loved the contrast between these more epic parts with the super deep Death growls. The clean male vocals keep everything from offset the intensity just enough to give it a classic metal feel. I really enjoyed the female vocals on “Power Process,” because they become the vocal focus of the song, instead of more a support role like in the previous tracks. This one also isn’t as busy as the others, opting for a more traditional Symphonic Metal song like EPICA or modern day NIGHTWISH. A vicious guitar solo, backed by Arien’s drumming, reminds us all that MAYAN is here for a more intense outing that any of the member’s full time bands. “The Illusory Self,” followings the track and the end of it is extremely intense, with a couple passage of JANSEN’s Death vocals ripping through everything before the song ends in a cacophony of several vocals, power drumming, Death growls, and a sweeping orchestrated attack. If “Power Process” was more traditional Symphonic Metal then “The Flaming Rage of God,” is that same thought process but on steroids. The riffs are downright scathing as are the Death vocals. The symphonic instrumentation is at once both furious and energetic, bringing about a sort of entertaining doom. Mark Jansen has taken MAYAN onto their best and boldest journey yet–it is a tale with a lot to say, if you are willing to invest the time to discover the many rewards that await within. Far as this style goes, this is the best you will find this year.